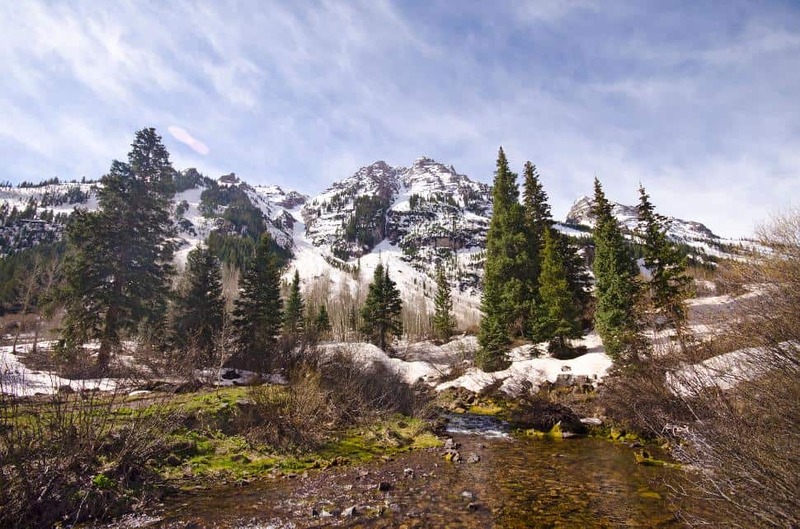 There really isn’t an off-season for heading up to Maroon Bells, not far from Aspen, Colorado. This is a place that welcomes hikers in summer, spring or fall – it is closed in winter. 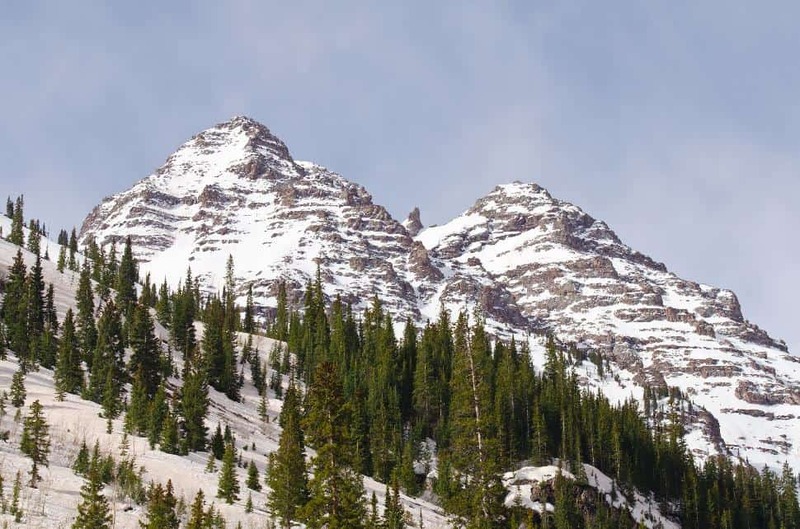 The landscape here is dominated by the two “bell” mountains, which have a beautiful reddish hue to them when the sun is shining, hence the name Maroon Bells. They’re composed of mudstone, unlike the rest of the Rocky Mountains around here, which are normally composed of harder granite. Scenic beauty is what draws hikers here, along with plenty of wildlife. 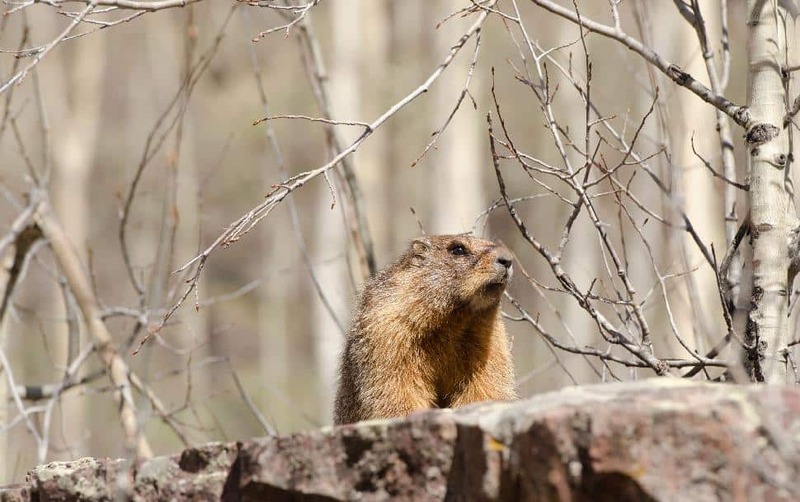 Marmots are very plentiful here, some hanging out not far from the trails, posing for photos. There is an active beaver hut not far along the main trail, and plenty of birdlife and other wildlife can be seen in the forests here. Once given the nickname “Deadly Bells”, the area has gained a reputation for its dangerous, unpredictable rock slides. That mudstone is not nearly as stable as one might think, so rock-climbing here is an extra challenge, luring in people from around Colorado and beyond. But, be careful these unstable peaks have taken their tool, with many climbers being killed here over the years! Indeed, it is safest to stick to the hiking trails here, and there are plenty to choose from with more than 100 miles total. 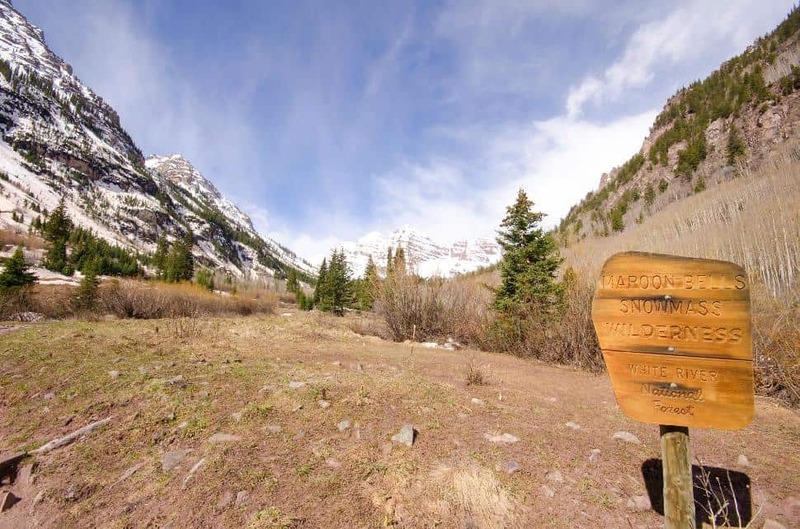 The trails at Maroon Bells criss-cross through forests and zig-zag over mountain peaks. A total of nine mountain passes with elevations above 12,000ft are included along the plentiful hiking trails. The further you push into the meadow fields, valleys and mountain passes, the more likely you are to encounter mule deer and elk which also call this wilderness area home. Chances are you’ll also encounter plenty of other hikers and outdoor adventurers along the way. This is a popular park, with a sometimes crowded access point. From Aspen Heights, buses run up to the park, to help alleviate the congestion. Perhaps the best time to visit if you’re looking to hike around without any crowds is right after the park opens, usually in mid-May, or just before it closes in November. Once the May holiday weekend hits, it only gets busier with each passing weekend. While the park is technically closed in winter, it is possible to hike in on your own or take a snowmobile / skiing trip into the park with local operators. Depending on weather and your interests, the maroon Lake trail is a simple 1-mile hike with great photography and wildlife spotting opportunities. It meanders along the lake and stays pretty flat. More of a family stroll type of hike, a good option if you’re interested in having a picnic or are short on time. If you want a more adventurous trail, then head towards the mountains at the Deadly Bells kiosk and take the 3.6mile Crater Lake trail. Expect steep trail conditions, passing by rockslides and uneven terrain. The challenge and views are worth the extra effort though, with Crater Lake lying above 10,000ft. Considering that the trailhead here is at 9,500ft, it isn’t a ton of elevation gain, but what you need to be wary of is the altitude in general. It can be very cool, even in summer, up at Crater Lake, so be prepared. This is pure Colorado wilderness, with no services available except for some toilets at the parking lot area before reaching Maroon Lake. If this isn’t enough of a trek for you, the even tougher 6.5mile hike to Willow Lake will take you up and over a pass, with plenty of rough, steep terrain. There you have it, a trio of trails to choose from depending on your preferences. 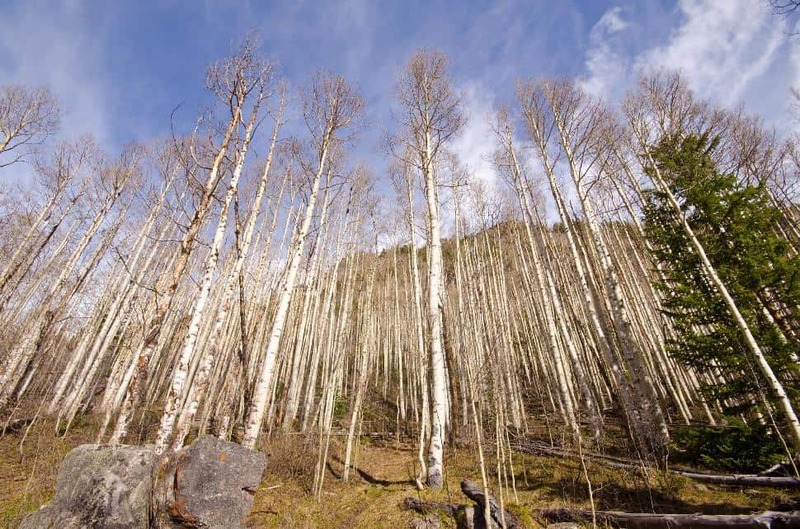 Or hike them all and spend a few days in this great area of Colorado!